This is Dr. Dale Barnard, a researcher at Utah State University. This is indeed the SARS laboratory, and he does have to get into that suit to work with the virus. 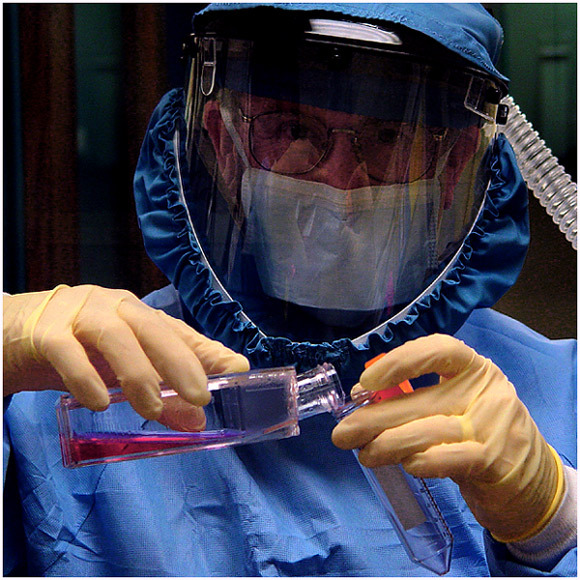 When he works with SARS, it is in a thick liquid that limits the amount it can become airborn. In terms of photography, I wanted to get the inhumanness of the suit, but if you look closely, you can also see his eyes. I also wanted a darker, moody photograph, representative of the SARS virus itself. We'll see if my communication can override folks preconceived notions! Thanks for the comments. This was a fun challenge, with lots of great photos. I'm surprised mine did so well and a bit saddened that so many excellent shots placed so far back. I was just outside a window and could not go in, as then my camera would have to have been detoxed (and ruined). But I asked if he could come to the window closer. I liked the dark look, and liked seeing the eyes as a second surprise. Wow! Pretty creepy. Were you suited up as well? Great photo and one of my favorites. nice david! congrats on 10th! great image, and very newsworthy/photojournalistic/timely! Very nice photo, one of the best this week I think. The face is a bit dark though, 9. Shouldn't he be looking at the tube, not you? I like the overall composition, but the colors look weird. Excellent shot! Looks like it could be on the cover of a magazine. One of my favorites this challenge. Ok. So do not tell me. You are going to spin that down then try to Culture it right??? My respect goes out to you my friend. I am not sure but I think it´s overprocessing. Do you know neat image? OK, now that\'s scary. a good photo, but scary. Timely and relevant image. This isn't just a good entry it's a story - that's what I enjoyed about this photograph. Well done and very original - 9. Proudly hosted by Sargasso Networks. Current Server Time: 04/21/2019 02:57:47 AM EDT.